Are you familiar with betrayal? The taste of power can be a deadly encouragement, a temptation of respect and grandeur. When presented with the opportunity for more power, most people jump head first and bash open a brick block with a question mark on it for the chance. Even if it means becoming a traitor. Not just any Toad of the mushroom kingdom, but the important one, you know, the one who screams “Hello!” as if he is constantly surprised and simultaneously having his vocal chords attacked by nails. Mario’s friend and Peach’s protector, Toad, is a beloved character of the Mario franchise and playable character in many Mario focused games. 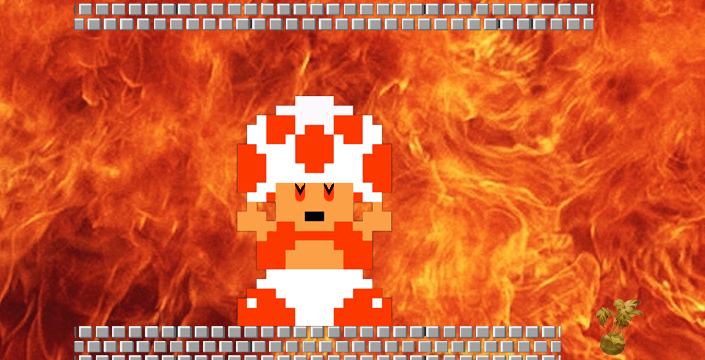 Who knew that Toad was the modern day Judas Iscariot of the Mushroom Kingdom? Picture this. In a society where everybody looks, sounds, and even acts the same, surely the desire to be different is a strong one. In Toad’s case, he doesn’t only want to be a different Toad but the best Toad. Toad has been silently sitting in agony, searching for a way to differentiate himself from the others. After all, when he wins a simple game of cart racing, he wildly declares “I’m the best!” to make himself feel better for winning a race against a giant ape and a carnivorous potted plant. Bowser, aware of Toad’s identity weakness, made Toad an offer that he couldn’t refuse. Toad became an informant for the Koopalings, and in return when Bowser finally comes into power of the Mushroom Kingdom, he will make Toad a puppet king of sorts. How else does Bowser repeatably break through the defenses of the Mushroom Kingdom? After twenty-five years of defense breaches, the only reasonable explanation is that Toad must be giving classified information to Bowser in return for power. Mario has been successful in retrieving Peach and defeating Bowser, for now. But the latest trend in Mario games is to have Toad be playable alongside Mario. Why? Because Toad is waiting for his perfect moment to stab Mario in the back, Brutus and Caesar style. Toad knows that Bowser will never win as long as Mario lives, and Toad needs Bowser to win so he can become King Toad. Blind by being power hungry, he is willing to kill his best friend when the moment is right so he may become king over the Mushroom Kingdom, and finally get the crown he covets. We can only hope that our favorite plumber will realize Toad’s true nature before it’s too late. Maybe Mario will start leaving Toad at home on his four-person missions, and will bring along more compelling and loyal soldiers of the Mushroom Kingdom.